Based on the geographical, Indonesia is the largest archipelagic state, located between two oceans (Pacific Ocean and Indies Ocean) and two continents (Asia continent and Australia continent). According to the data from CIA, Indonesia has 1,904,569 Km2 total area that consist of 1,811,569 Km2 land area and 93,000 Km2 water area, meanwhile Indonesia has 54,716 Km2 coastline with maritime claims measured from claimed archipelagic straight baselines territorial sea 12 miles and exclusive economic zone 200 miles. As an archipelagic state, this strategic location caused Indonesia facing many dispute and threat from neighboring states around Indonesian Archipelagic Sea Lanes (Alur Laut Kepulauan Indonesia (ALKI)). Indonesian Archipelagic Sea Lanes itself is a sea lanes that traversed by ships or foreign aircraft above the groove, to implement shipping and aviation in the normal mode solely for transit continuous, direct, and as soon as possible and not be deterred by or on over the archipelagic waters and the adjacent territorial sea between one part of the high seas or the Indonesian exclusive economic zone and on the high seas or other Indonesian Exclusive Economic Zone (EEZ). According to Government Regulation No. 37 of 2002, about Indonesian Archipelagic Sea Lanes, there are three branches of ALKI. First, the line on ALKI I functioned for a cruise of the South China Sea through the Natuna Sea, Karimata Strait, Java Sea and the Sunda Strait to the Indian Ocean, and vice versa; and to cruise from Singapore Strait through the Natuna Sea and vice versa (sea lanes Branch I A). Second, the line on ALKI II which functioned for a cruise across the Strait of Makassar Sulawesi Sea, Flores Sea and the Lombok Strait to the Indian Ocean, and vice versa. Thirdly, the line on ALKI-III-A, which functioned for a cruise of the Pacific Ocean via the Maluku Sea, the Seram Sea, the Banda Sea, Ombai Strait and the Sawu Sea. Each ALKI have a potential threat that consider relevant and need the seriousness coordination.However, from all of Indonesian Archipelagic Sea Lanes, the location of most risk to Indonesia is the ALKI I because it is often experience the conflict. South China Sea became concern to Indonesia because the Indonesian navy has multiple times facing Chinese fishing vessels trawling within the 200-miles Exclusive Economic Zone surrounding the Natuna Islands. Indonesia navy also has multiple times facing Chinese People’s Liberation Army Navy (PLAN) in Indonesia’s water territorial. Though Indonesia is not officially a claimant in the South China Sea disputes, China’s nine-dash line overlaps with the exclusive economic zone (EEZ) around the Natunas. By this issue, I will concern to explain the threat from maritime. In the last 30 years, China’s economic growth rapidly and it makes China become one of powerful economic country in the world. From World Bank data, in 2015, the GDP of China is USD 11,008 Trillion and this rapid growth of economic is an asset to build a military power. According to data from SIPRI, in 2015, military expenditure by China as a share of GDP is 1.9% so from the data, the China’s military expenditure in 2015 is USD 214,475 Million. China armed forces or also known as People’s Liberation Army (PLA) consists of four services: the PLA Army (PLAA), the PLA Navy (PLAN), the PLA Air Force (PLAAF), and the PLA Rocket Force (PLARF). The PLA Navy (PLAN) is China’s mainstay for operations at sea, and is responsible for safeguarding its maritime security and maintaining its sovereignty over its territorial seas along with its maritime rights and interests. The PLAN is composed of the submarine, surface vessel, naval aviation, marine corps and coastal defense arms. In line with the requirements of its offshore defense strategy, the PLAN endeavors to accelerate the modernization of its forces for comprehensive offshore operations, develop advanced submarines, destroyers and frigates, and improve integrated electronic and information systems. Furthermore, it develops blue-water capabilities of conducting mobile operations, carrying out international cooperation, and countering non-traditional security threats, and enhances its capabilities of strategic deterrence and counterattack. For the PLA Navy (PLAN), a naval staff headquarters in Beijing forms the command level below the CMC. The highest operational command level in the PLAN is made up of three fleets – the North Sea Fleet, the East Sea Fleet, and the South Sea Fleet. In North Sea Fleet, there is 1 aircraft carrier, nuclear powered ballistic submarines, 3 nuclear power-attack submarines, 19 diesel-powered attack submarines, 7 destroyers, 12 frigates, 9 corvettes, amphibious transport docks, 2 tanks landing ships, 6 medium landing ships, and 18 missile patrol craft. In East Sea Fleet, there is aircraft carriers, ballistic power submarines, nuclear powered marines, 18 diesel powered attack marines, 9 destroyers, 19 frigates, 6 corvettes, amphibious transport docks, 14 tank landing ships, 9 medium landing ships, and 40 missile patrol craft. In South Sea Fleet, there is aircraft carrier, 4 nuclear powered ballistic missile submarines, 2 nuclear powered attack submarines, 20 diesel powered attack submarines, 7 destroyers, 21 frigates, 8 corvettes, 3 amphibious transport docks, 11 tank landing ships, 7 medium landing ships, and 38 missile patrol craft. Indonesia has a doctrine of defense that contain in the Indonesia Defense White Paper. This doctrine is a guide for Indonesian armed forces to create a strategy. Indonesia’s defense is arranged in a total defense system in order to achieve national goals that list in preamble of 1945 Constitution of the Republic of Indonesia. A total defense implies the involvement of all the people and all the national resources, national infrastructure, as well as the entire territory of the country as whole defense complete and comprehensive. Total defense system is established to integrate military defense and non-military defense, through efforts to build strength and national defense capability that is strong and respected and has a high deterrent power. From economic aspect, according to World Bank Data and SIPRI data, Indonesia GDP in 2015 is USD 861.934 Billion with military expenditure as share of GDP is 0.9%. So from the data can be concluded that Indonesia military expenditure in 2015 is USD 7641 Million. This military budget is allocated to personnel expenditure, goods expenditure (buy Defense Equipment/ ALUTSISTA for Army, Navy, and Air Force), and capital expenditure. Compared with the countries in the Southeast Asia region with the military expenditure constant USD in 2015, Indonesia rank 2nd after Singapore (USD 9417 Million) and with the military expenditure as share of GDP in 2015, Indonesia rank 9th after Myanmar (3.9%), Brunei (3.7%), Singapore (3.2%), Vietnam (2.3%), Thailand (1.6%), Malaysia (1.5%), and Philippines (1.3%). Indonesia’s defense posture consists of active personnel, paramilitary personnel, and reserve personnel. There are 395.500 active personnel of Indonesian military (TNI) that consist of 300.400 Army (AD), 65.000 Navy (AL), and 30.100 Air Force (AU). In Army, there is 13 military area command (KODAM). In Navy, there are two fleets: Western Fleet (KOARMABAR) and Eastern Fleet (KOARMATIM). In Air Force, there are two operational commands: West Command and East Command. Indonesian naval western fleet based is based on Jakarta and Indonesian naval eastern fleet is based on Surabaya. 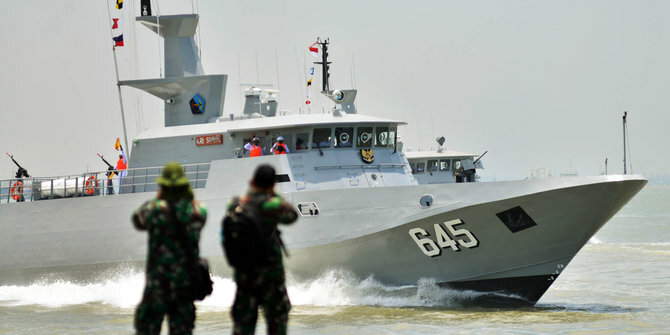 Indonesian Navy has military equipment such as 2 Cakra tactical attack submarine with ASW capability, 11 frigates (6 Ahmad Yani, 1 Ki Hajar Dewantara, 4 Diponegoro), 88 patrol and coastal combatants (21 corvettes, 24 patrol crafts, 43 coastal boats), 11 mine warfare (2 ocean mine countermeasure, 9 coastal mine sweepers), Amphibious (5 LPD, 21 LST, 55 landing crafts), 32 logistic and support, 23 maritime patrol aircraft, 36 light transport aircraft, 4 maritime reconnaissance helicopters, 15 transport helicopter. The rise of China and the China’s intention and capability in military should be Indonesia concern because by seeing China’s military expenditure and China’s naval military equipment, and compared to Indonesia’s military expenditure and Indonesia’s naval equipment, Indonesia is still far behind from China. Indonesia needs a lot of efforts if they want to balance and protect their territorial water from China because their navy still categorized as Brown Water Navy. Brown Water Navy itself is a capability of navy to protect water territorial around coast. As archipelagic state, at least the capability of Indonesia Navy should in Blue Water Navy (capability of navy to operating across the deep waters of open oceans) and under President Joko Widodo Era with his World Maritime Fulcrum vision there is a policy to reform Indonesia Navy from Brown Water Navy to Green Water Navy (capability of navy to operate in the open oceans of its surrounding region) until 2024. To make the policy works, Indonesia needs to development of a coherent maritime strategy. First, Indonesia should increase defense budget from below 1% to 2% as share of GDP so the military can reach Minimum Essential Force (MEF) and have a funds to modernization defense equipment or ALUTSISTA. Second, Indonesia should reform its navy ALUTSISTA that had function only for coastal guard to ALUTSISTA that had function to operate in the open oceans near surrounding territorial. Last not least, third is increasing the number of fleet from two fleets into several that deploy in some points. The places that I consider potential to become a fleet is Jakarta, Surabaya, Riau Islands, South Sulawesi, and North Sulawesi. The rise of China in economic also strengthen its military sector that have a potential threat to Indonesia. Indonesia as archipelagic state that has sovereignty should not allow others state claims its territorial for example like Natuna Islands that claims by China’s nine-dash line. Compare to China, military sector in Indonesia still far behind, because of it Indonesia should strengthen its military sector capabilities especially in Navy. Indonesia needs transformation in military expenditure and navy equipment so they can face the future threats from maritime. Kementerian Pertahanan Republik Indonesia,. (2015). Buku Putih Pertahanan Indonesia.